No doubt fueled by the media storm surrounding last year's Crown Crust launch abroad, Pizza Hut announced Monday the debut of the similar Crazy Cheesy Crust Pizza in the U.S. It's essentially the next generation of stuffed-crust pizza. 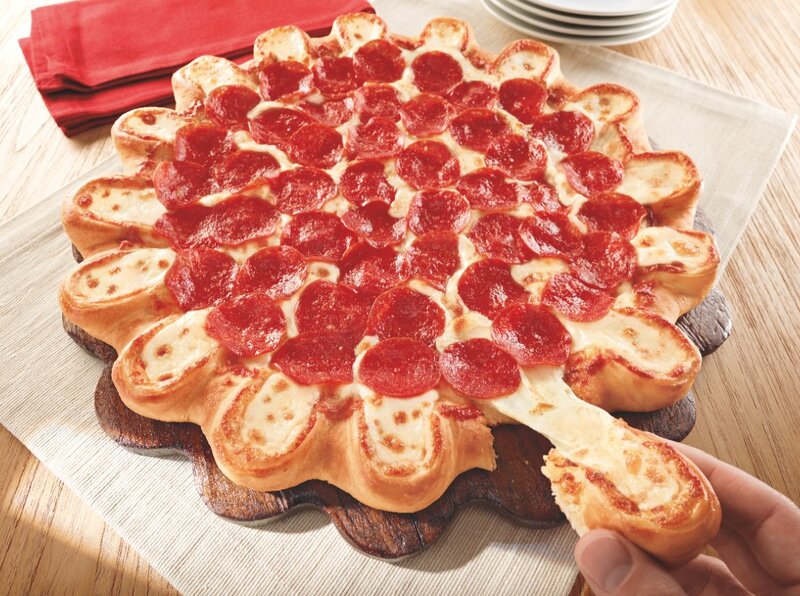 The Crazy Cheesy Crust Pizza offers a ring of cheese pockets around the crust, two per the average slice. The pockets contain a five-cheese blend of provolone, asiago, mozzarella, fontina and mild white cheddar. They can be pulled off individually or eaten as part of the slice. The rest of the pie comes with the same toppings as regular pizzas, but the toppings do not cover the cheese pockets. The new pizza will launch on April 3 and will be available for a period of six weeks to three months, Pizza Hut spokesman Doug Terfehr told The Huffington Post. A pie will cost $12.99 with a single topping -- three dollars more than a regular pizza. Terfehr was vague about the odds of the item staying on the permanent menu, but he alluded to the possibility that it might be brought back in the future. So what does this bad boy taste like? While the shape is somewhat revolutionary, the taste isn't. The pockets are a little bit sweet, the five different cheeses aren't individually perceptible, and they definitely taste different than the cheese on the rest of the pizza slice. HuffPost Food editors agreed this is a pie for super serious cheese lovers -- it's decadent and intense. It's also a very heavy slice, good for a gluttonous mood. But it sits like lead in your stomach, so be careful how many slices you consume. Pizza Hut Executive Chef Wiley Bates is very enthusiastic about the new pie and said he would like to see it as a core item on the menu. He described the launch as a "fastball down the center" between Pizza Hut's traditional offerings and the notion of the Crown Crust. Bates said the Crazy Cheesy Crust probably took about a year to develop from start to finish. During testing, the culinary team experimented with everything from pesto to pepperoncini, sun-dried tomatoes to bacon. They played around with ingredients on top of the cheese pockets and under them. It's likely that this current limited-time offering is merely testing the waters for the Crazy Cheesy Crust concept. Yum Brands, Pizza Hut's parent company, prides itself on innovative products. When Pizza Hut introduced stuffed crust in 1995, it pretty much changed the pizza game. Now Bates is busy trying to envision the next frontier in pizza. Several times during the course of our conversation, he asked, "What is 2.0 for us?"